The very meta movie works largely in part to Downey’s irresistible narration. A part of the events yet telling them from afar, his perspective is certainly a strange one. At times, he is omniscient; at others, limited. Yet almost all the time, he’s a bumbling genius flying by the seat of his pants through a set of unforeseeable events. After robbing a game store, his Harry runs unknowingly into a casting session for a role that is eerily reminiscent of the events of his law-breaking night. Taken for an incredible method actor, the producers claim him to be their “big discovery” and fly him out to Hollywood for the next round of preparations. Once in Hollywood, Harry deals with culture shock at a party, a little unsure of how to act around California socialites. However, he reunites with his high-school sweetheart Harmony (Michelle Monaghan) unexpectedly and a romance begins to bloom. Taking him for a detective, not an actor (which he also is not), she involves him in the investigation of her sister’s curious death. Harry, along with actual investigator Perry van Shrike (Kilmer), probe deeper and find themselves entangled in a web involving two murders and some very scary connections. 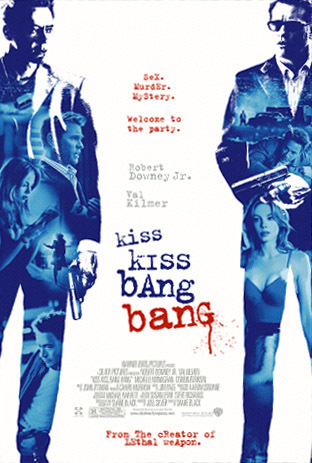 While the plot may get a little confusing at times, “Kiss Kiss Bang Bang” is incredibly entertaining because of its clever blend of humor and mystery. The performances from Downey and Kilmer are dynamic and light up the screen. The plot is intelligent, and the fresh narrative style makes the somewhat hackneyed plot very fun to watch again. So the script is intelligent AND confusing. I’ll have to see this. It all gets ironed out in the end, but at times it gets really complicated. Confusing might not have been the best word choice. More and more people are coming round to the idea that this is a really good film. I love it. Glad you’ve given this some attention. One of my favorite “you’ve never ever heard of this but it’s really good” movies.